Domperidone is a prescription medication. It is used to help treat and prevent symptoms of stomach disorders. It helps to prevent nausea and vomiting due to certain medications and health conditions. This is done by helping the stomach to empty more quickly. Domperidone belongs to the class of drug known as dopamine antagonist. It is also used to treat slowed movement in the gastrointestinal tract due to inflammation of the stomach lining. Domperidone helps improve vomiting, bloating, nausea and feeling of fullness. It is also used for gastroesophageal reflux in children. It helps keep the entrance to the stomach properly closed so the content of the stomach won’t leak back up. This will make children less likely to have reflux after a meal. It is available in tablet and liquid form both as generic and brand names. Give Domperidone before each meal. The usual dose for an adult is 10mg 15 to 30 minutes before each meal. The maximum daily recommended dose is 30mg. Take your dose exactly as directed to you by your doctor. Do not increase your dose or take more than often. For liquid medicine, shake the bottle well. Use the medicine spoon to measure the right amount of this medication. For tablet form take it with water. Do not chew the tablet. You Can Buy Vomistop Here. Contact your doctor right away if you will experience any of the rare side effects mentioned. Use this medication at its lowest effective dose and for the shortest possible time. The maximum duration of treatment should not exceed 1 week. If children vomit less than 30 minutes after a dose, give them again the same dose. If children vomit more than 30 minutes after a dose, do not give another dose. Always take this medication before a meal for the best possible result. Domperidone tablet is not suitable for use in children weighing less than 35 kg. Patients with a renal problem must use this medication with care. Limit your alcohol intake when while you use this medication. Inform your doctor if you are using any other medications. Do not take this medication if you are allergic to ketoconazole. 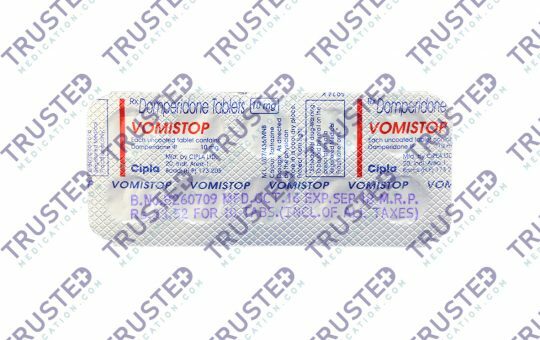 Do not take this medication if you have bleeding or blockage in the intestine or stomach. Pregnant women can only use this medication when clearly needed.